As an avowed theoretician, I’m not much good at being an experimentalist (of any kind), so when it came time to plan out my costume for Halloween, I was drawing blanks. Luckily Zoe came to my rescue with a great idea to go as the late great Richard Feynman after he won his Nobel Prize in 1965. You’d normally think, what kind of costume would a formal suit be for Halloween and how would anyone know I was supposed to be Feynman? Fortunately, Feynman rarely followed the norm, and his attire for the Nobel Prize was no exception. He wore a dashiki, an often colorful men’s garment widely worn in West Africa that covers the top half of the body. Being a Feynman groupie like myself, Zoe volunteered for the creative task of making me a Feynman dashiki shirt. Check out her handy-work in the inset photo. 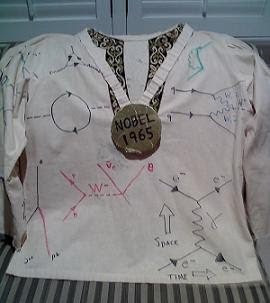 She found the shirt at a local clothier and hand drew all the cool Feynman diagrams and constructed a faux Nobel Prize medallion. I looked rather dapper as Feynman. I thought of carrying along my bongos to heighten the effect, but they are professional grade bongos and rather heavy to lug around all night. I donned the shirt and medal with pride, but never expecting to be recognized. I was right, although one person asked only be dazed over with my response. Zoe and I went to the West Hollywood Halloween Costume Carnival, and for those of you not from this area the annual event draws a massive crowd. As we sat in a very happening bar on Robertson Blvd., we attempted to review the printouts that served as models for the Feynman diagrams on my shirt. Alas the madness, alcohol, and excitement of the evening were too overpowering so we moved on to see the sights. The creativity put into the costumes we witnessed on the street was stellar, but I felt in my own kind of creativity hot zone wearing Zoe’s design. I can safely say I was very likely the only physicist at the festival and loving every minute of it!